December 19, 2017 – When NASA’s Orion spacecraft hurtles toward Earth’s surface during its return from deep-space missions, the capsule’s system of 11 parachutes will assemble itself in the air and slow the spacecraft from 300 mph to a relatively gentle 20 mph for splashdown in the Pacific Ocean in the span of about 10 minutes. As the astronauts inside descend toward the water on future missions, their lives will be hanging by a series of threads that have been thoroughly ruggedized, tested and validated to ensure the parachute-assisted end of Orion missions are a success. Through a series of tests in the Arizona desert, the engineers refining Orion’s parachutes have made the road to certifying them for flights with astronauts look easy, including a successful qualification test Dec. 13 that evaluated a failure case in which only two of the systems three orange and white main parachutes deploy after several other parachutes in the system used to slow and stabilize Orion endure high aerodynamic stresses. But behind the scenes, engineers are working hard to understand and perfect the system that must be able to work across a broad range of potential environmental conditions and bring the crew home. While Orion’s parachutes may look similar to those used during the Apollo-era to the untrained eye, engineers can’t simply take that parachute system and scale it up to accommodate Orion’s much larger size. Through testing and analysis, technicians have developed Orion’s parachutes to be lighter, better understood and more capable than Apollo’s. NASA has also been able to adjust the system as elements of the spacecraft, such as attachment points, have matured. Orion’s parachute system is also incredibly complex. About 10 miles of Kevlar lines attach the spacecraft to the outer rim of nearly 12,000 square feet of parachute canopy material – over four times the average square footage of a house – and must not get tangled during deployment. In addition to the fabric parachutes themselves, there are cannon-like mortars that fire to release different parachutes. Embedded in several parachutes are fuses set to burn at specific times that ignite charges to push blades through bullet proof materials at precise moments, slowly unfurling the parachutes to continue the sequential phases of the deployment sequence. All of these elements must be developed to be reliable for the various angles, wind conditions and speeds in which Orion could land. With the analysis capabilities that exist today and the historical data available, engineers have determined that approximately 20-25 tests, rather than the more than 100 performed during the Apollo era, will give them enough opportunities to find areas of weakness in Orion’s parachute system and fix them. After the three remaining final tests next year, the system will be qualified for missions with astronauts. 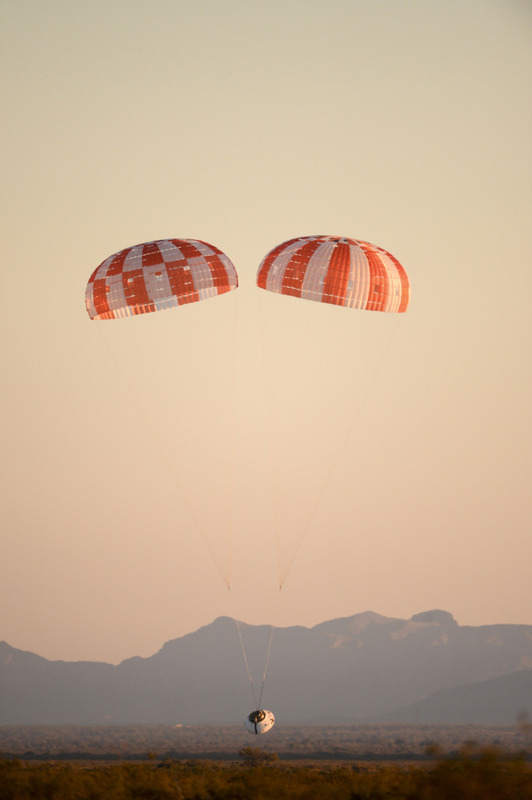 Orion parachute engineers have also provided data and insight from the tests to NASA’s Commercial Crew Program partners. NASA has matured computer modeling of how the system works in various scenarios and helped partner companies understand certain elements of parachute systems, such as seams and joints, for example. In some cases, NASA’s work has provided enough information for the partners to reduce the need for some developmental parachute tests. Parachute testing is just one part of the vast expanse of work being performed across the country that enable humans to venture farther into space than ever before.